I started smoking pipes (plural) after many years of struggle with cigarettes. I've never been a fan of menthol. However, I have been a fan of tobacco taste and smell. Like most of us, I've enjoyed sampling as many of the blends as I could during my first years in this 'sport', and I've gravitated to unadulterated, dry, bagged blends from D&R. D&R recently offered a new twist to a couple of their established blends calling them "Green" and in the P&C description of the Pennhooker Green they describe a minty taste. Unlike D&R's Wintergreen, which does have a minty taste, the Pennhooker Green tastes like menthol. Not what I call minty. So, I've got a pound of this green Pennhooker that tastes just like a Salem on retrohale, and I'm in that stage where I either keep smoking this stuff till I like it, or I put it away, trade it, give it away or throw it out. After the initial shock, I did smoke this blend in a couple of pipes to see how that made any difference, and I did become somewhat 'familiar' with the new taste. I'd say, this will be a polarizing blend. If it were me, I'd get rid of it, but I am not a fan of minty tobaccos. I was at a pipe show, when a heavily accented guy asked me if I would like to try some tobacco he made, very Italian. I was fairly new to pipes, so I said sure, seemed like a novel thing to do, make tobacco that is. He handed me an Altoid tin full of tobacco. I should have taken that as a que, but I lit it up to get a cold green tasting mouthful of disgust. I smiled bleakly, and asked him what this was. He had mad a peppermint tobacco. He was a assistant professor at a local college, from Italy. He said that he missed a minty blend that he used to get in Italy. I politely took one more puff, smiled and excused myself to empty my pipe in the bathroom, where he couldn't see me. But, if you like the stuff... have at it. Like what you smoke, and smoke what you like. My daughter smokes menthol cigarettes, unfortunately. So I thought if I got some Kendal menthol she may try ryo, or even dare I say, try smoking a pipe? But she was averse to even looking at the tobacco. Instead she countered: you should stop being a weirdo and just smoke cigarettes. Anyway I tried it and it was nice,in a novel sort of way. No subtle complexity, very one note. But a strong nic hit and a pleasant relaxing smoke. I haven't smoked a second bowl of it yet and Its been about a month but I'm not disowning it either. And btw I don't care for me reg Kendal so the menthol makes all the difference.. It's been so long since I have been around anyone smoking a menthol cigarette. Does it have a nice room note? Menthol is such a distinct scent, and so closely associated in my mind with other peoples' cigarettes from the past -- family, friends, and strangers. For entirely subjective and irrational reasons, it has heavily forlorn and melancholic associations for me, empty bus stations at three in the morning. But if it tastes and smells zippy and bracing to you, I guess it is like any other flavoring. If it didn't have this baggage for me, my next question would be, does it bring up and support the tobacco flavors? I'd prefer whiskey, rum, or liqueur flavoring. When I smoked cigarettes, menthol was all I wanted. Till they got banned in Canada, because they 'lure youth to tobacco'. I might try these blends; thanks for the heads-up. Banned in Canada? Wow, hb clove cigarettes? They are no more in the states, sadly, was the one cig that smelled good to me.. I think someone was asking about clove pipe tobacco here recently. Well, I would suggest anyone smoking this will likely retro hale the char light once. The menthol does settle down some after that, and the tobacco is premium Virgina leaf. I dumped the bag in my mixing bowl to expose it to the air for awhile to let that topping mellow some. I've smoked a few bowls now. What can I say? I'm trying to keep an open mind. Obviously, I don't think it's horrid. 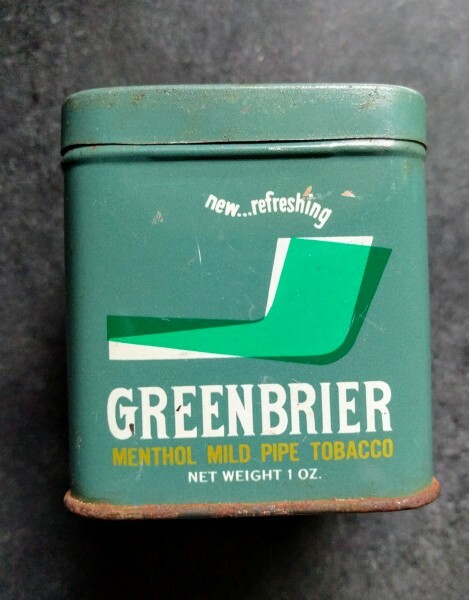 There was a brand many years ago called "Green Briar" that was menthol. Never smoked it...I just have an empty tin. I do like a scent called Cartier Roadster, which has a strong, natural, mint oil base. It doesn't smell like toothpaste. It is dark and green and quite pleasant. And as fas as I am aware, SG's Navy Flake has a light top of menthol. More like a mysterious seasoning than anything else. I thoroughly enjoy that tobacco.